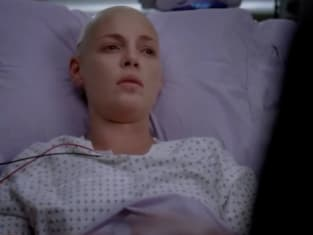 Izzie: Oh my god Derek! Alex: Dude, get a room! Izzie: On the stairs? Doesn't that hurt? Meredith: Leave us alone, we're newly weds. Izzie: A post it wedding does not make you newlyweds. Derek: You know what... you're newlyweds too. You need your own space. Alex: Dude, what are these? Derek: Key's to my trailer, your new home. Enjoy.